In addition to Startup Commons official versions below, there are several variations and versions created by other, under Creative Commons License terms. If you have created modified versions and would like those to be showcased along with the original, please contact us and let us know. The early beginning of this document and framework was created into a presentation format for ”Start-up experiences, practical tools and match making” event at Nokia 2012. The presentation was named “Key stages of early stage startup venture”, presented by Valto Loikkanen, creator and author of the original document and most of the key version updates. While this was the beginning of this "communication tool", what lead to reasons to originally create it, was many years of frustration on the lack of more systematic and "universal enough" way of communicate many essential things about startups and startup journey especially from founders and entrepreneurs ie. "business creators" perspective, while also taking into account and incorporating other perspectives related to it, - most importantly external "investors" perspective. Another key reason was to focus on types of things that are "basic knowledge" relevant to majority of startups and things that new founders need to know about, learn about and make decisions about. While the first MVP version was in the several slides presentation format version, the second MVP was the first visualization for trying to communicate all the key elements and as such condense the value in into one single image/slide. One of the most significant change between the first and second MVP was to change the stage to start from -2 and NOT from 1. March 2013 - Named as "Venture Timeline" was the first published version and "free to share" communication tool to help understand startups and startup journey, identify startup key milestones and help develop Startup "idea to product" and "team to company" in a balanced manner, with a note that in addition to innovation of building an idea to product or business model, startups also need to build a strong committed founding team and grow both into a real company among other things. ​Also an important part for creating this tool was to give a holistic perspective to building startups, that take into account and try add in, all the popular and trendy terminology, but also include crucial parts that are often left unnoticed due noise of trendy topics alone. 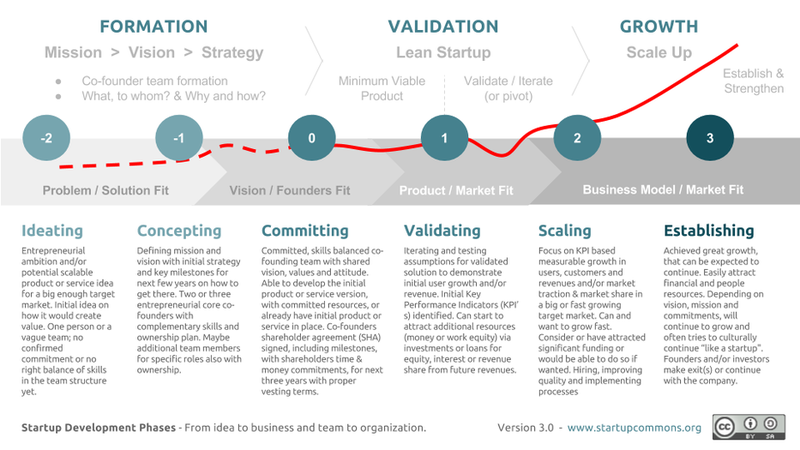 Also to give perspective to whole startup creation process from multiple viewpoints and not only from investors perspective (funding rounds) or by focusing on one key method alone (lean startup). 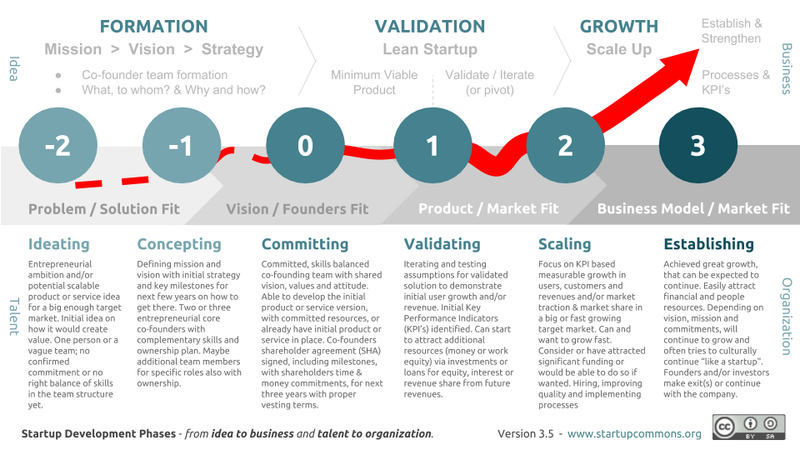 New gray "fit bar" was added to communicate some of the key validation targets around each of the main phases, including Idea / Team Fit, Product / Market Fit and Business Model / Market Fit. 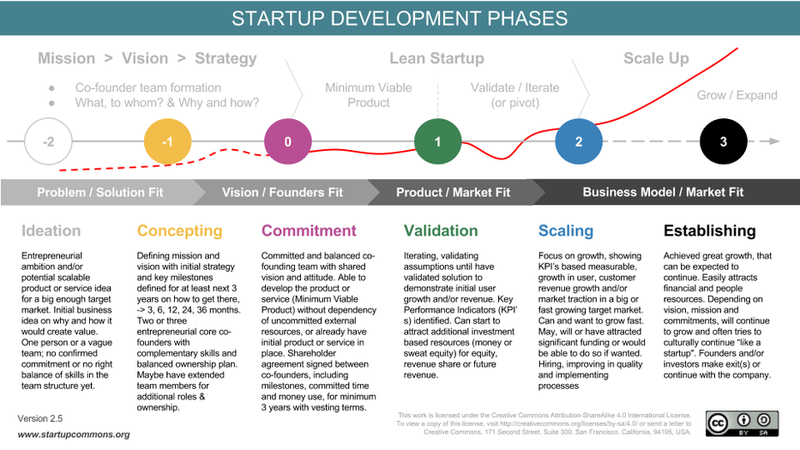 Key phases naming was refined, acronyms written open and action focused subitems added, including Business Model Canvas, Team Building, build / release, Validate / Iterate and Scale / Expand. Dotted gray lines related to read line were removed, along with vertical Growth & horizontal Time titles, due not adding much value, while adding visual noise. ​Original license holder URL was changed from www.growvc.com to www.startupcommons.org as part of Grow VC Group organizational restructuring, also duplicate document naming use was refined from Venture Timeline and Startup Key Stages to Startup Development Phases. Size ration was changed from standard 4:3 to widescreen 16:9 format, some adjustment for the red line for visual improvement, in "Gray Fit bar" and thin vertical lines in stage 0 and 2 changed to "arrows style" to add feel of progress/process and to better indicate that while each step have focus, they also contribute to learnings and skills needed in next stages. Also Creative Commons license used was updated from 3.0 to 4.0 and the CC label was updated. Replaced Business Model Canvas with more action and target oriented items; What, to whom? Why and how? While Business Model Canvas is no longer mentioned in the image itself, it remains as one key tool to find answers to those questions. But there are also other good tools and methods to use to help find the right answers. 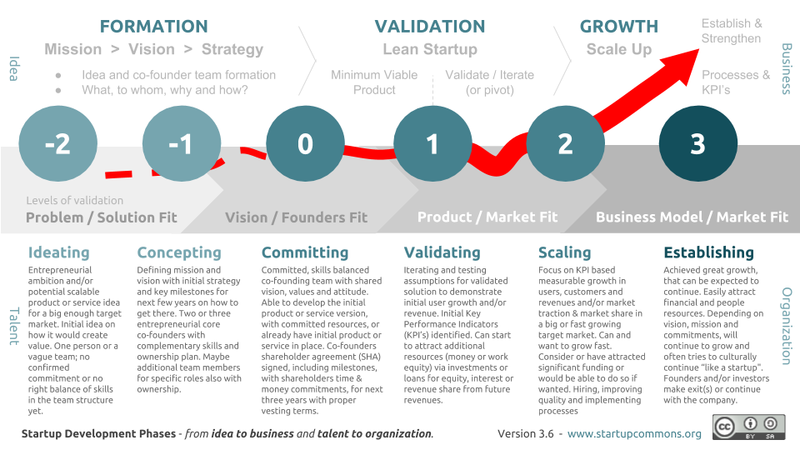 Due growing use of Scale Up terminology, changed the segment headline from Growth to Scale Up, to help communicate and identify the Scale Up phase in the overall startup development process. 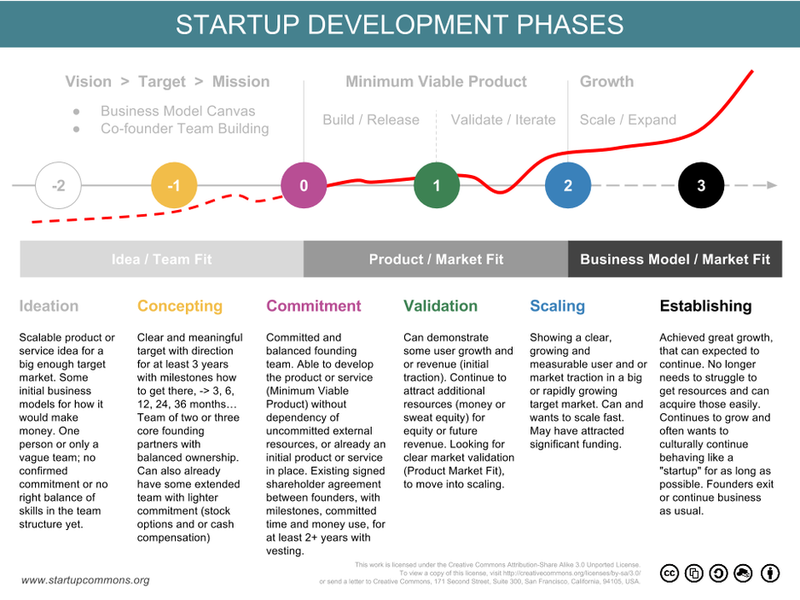 In addition to these main changes, each key stage descriptions were refined to harmonize the overall language, by adding terminology in early phases to include entrepreneurship attitude, mid parts to have more separation and clarification between co-founders and team as a whole, and in later phases to add activities like focus on KPI's, implementing processes and hiring. Main change for version 3.0 was made for the visual outlook, to continue simplify the document. The big headline was removed from top and the name of the document was moved to be discreet at bottom left and additional description was added along with the document name to help give context on idea to business and team to organization part. The "FORMATION", "VALIDATION" and "GROWTH" segment headlines were added on top. At the same time some of the main stages headline wording was harmonized. Colors from key stages was also harmonized as the multiple different colors was validated by anyone at that point to have additional value in real use. For green only some tints was left to create feeling of progress and to match with gray fit bar element. Creative Commons longer text was removed to give more space and simplify document and the website and version number was added to that position. Some adjustment for the red line for visual improvement was made. In "Gray Fit bar" was made taller to be more prominent and visually nicer to connect with the green stage number circles. Main change for version 3.5 was made to improve visual outlook. Key stages numbering size was increased, as those have continued to become the validated standard way of communicating in various regions utilizing the framework intensively. 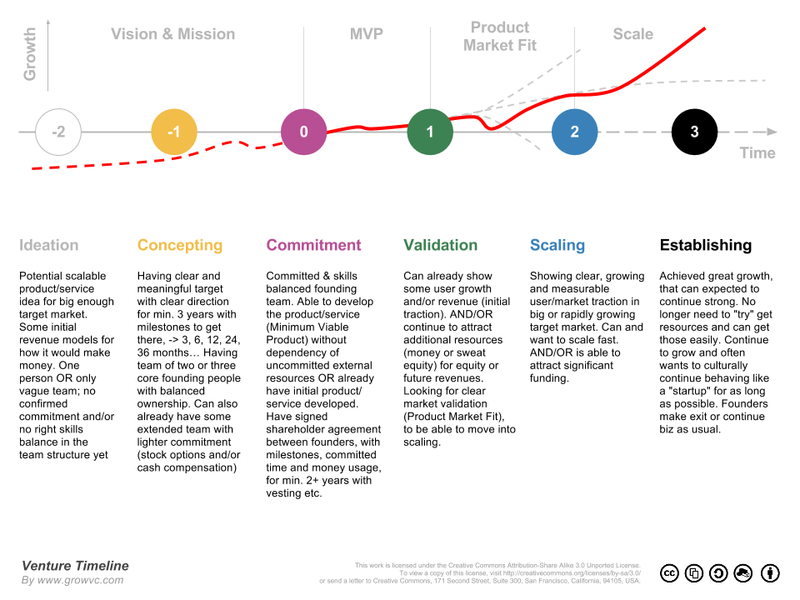 The "red line" visualizing the business development journey, was also made more visually interesting and descriptive to indicate strengthening of business by becoming thicker as journey progress and to have arrowhead at the end to communicate continuing journey. As a new items; on top "GROWTH - section, words "Processes & KPI’s" were added, to highlight the importance of those at the growth phase. New "vertical words" in each of the four corners were added to highlight the two parallel developments that should develop in sync, from "Idea to Business" and from "Talent to Organization", as these two parallel tracks have also become standardized in practise, to be key part of the frameworks communication value. Along with these being added the previous bottom part; "team to organization" was changed to "talent to organization", to reflect the reality of the earlier -2 stage, where there ofen actually is not team existing yet. ​Along with sizing the stage numbers, also the size of the gray "fit bar" was increased. Fonts being used were further harmonized and generally several items were slightly repositioned and adjusted. Live Version 3.6, March 2018. Following the feedback at Lean Startup Finland Group, the "fit bar" was given an actual descriptive name "levels of validation". This is aiming to highlight, that while at higher level there is a bigger key "Validation" phase focusing on validating both product and team, - the overall validation is also longer process and happens at different phases and levels as well throughout the overall development, where product validation is just one part. Naming the "fit bar" to reflect validation levels, hopefully communicates this more clearly. While updating the document to new version, a small tweak to add word "idea" to formation phase first bullet point was also made, to make the phrase more clear to indicate balanced focus on both idea and team formation tracks. Questions? Improvement Suggestion or Feedback? Please feel free to comment below or send us a private message via our contact form.